This article is about the Indian actress. For other uses, see Nargis (disambiguation). Nargis Dutt (born Fatima Rashid; 1 June 1929 – 3 May 1981), also known by her stage name Nargis, was an Indian film actress, who starred in classic films of Bollywood. Regarded as one of the greatest actresses in the history of Hindi cinema, she made her screen debut in a minor role at the age of 5 with Talash-E-Haq (1935), but her acting career actually began with the film Tamanna (1942). In a career that spanned three decades, Nargis appeared in numerous commercially successful as well as critically acclaimed films, many of which featured her alongside actor Raj Kapoor. She was the younger sister of the well-known actor Anwar Hussain. Her best-known role was that of Radha in the Academy Award-nominated Mother India (1957), a performance that won her the Filmfare Award for Best Actress. She would appear infrequently in films during the 1960s. Some of her films of this period include the drama Raat Aur Din (1967), for which she received the inaugural National Film Award for Best Actress. Nargis married her Mother India co-star Sunil Dutt in 1958. Together they had three children, including the actor Sanjay Dutt. Along with her husband, Nargis formed the Ajanta Arts Culture Troupe which roped in several leading actors and singers of the time and held stage shows at border areas. In early 1970s, Nargis became the first patron of The Spastic Society of India and her subsequent work with the organisation brought her recognition as a social worker and later a Rajya Sabha nomination in 1980. Nargis died in 1981 of pancreatic cancer, only three days before her son Sanjay Dutt made his debut in Hindi films with the film Rocky. In 1982, the Nargis Dutt Memorial Cancer Foundation was established in her memory. The award for Best Feature Film on National Integration in the Annual Film Awards ceremony is called the Nargis Dutt Award in her honor. Nargis was born as Fatima Rashid in Calcutta, Bengal Presidency, British Indian Empire (now Kolkata, West Bengal, India). Her father Abdul Rashid, formerly Mohanchand Uttamchand ("Mohan Babu") Tyagi, was originally a wealthy Mohyal Brahmin Hindu heir from Rawalpindi, Punjab Province who had converted to Islam. Her mother was Jaddanbai, a Hindustani classical music singer and one of the early pioneers of Indian cinema. Nargis' family then moved to Allahabad from West Punjab. She introduced Nargis into the movie culture unfolding in India at the time. Nargis' maternal half-brother, Anwar Hussain (1928–1988), also became a film actor. Fatima made her first film appearance in the 1935 film Talashe Haq when she was six years old, credited as Baby Nargis. Nargis (نرگس [ˈnərɡɪs]) is a Persian word meaning Narcissus, the daffodil flower. She was subsequently credited as Nargis in all of her films. Nargis appeared in numerous films after her debut; she won lasting fame for her later, adult, roles, starting with at the age of 14, in Mehboob Khan's Taqdeer in 1943 opposite, Motilal. She starred in many popular Hindi films of the late 1940s and 1950s such as Barsaat (1949), Andaz (1949), Jogan (1950), Awaara (1951), Deedar (1951), Anhonee (1952), Shree 420 (1955), and Chori Chori (1956). She appeared in Mehboob Khan's Oscar-nominated epic drama Mother India in 1957 for which she won the Filmfare Best Actress Award for her performance. Baburao Patel of the film magazine Filmindia (December 1957) described Mother India as "the greatest picture produced in India" and wrote that no other actress would have been able to perform the role as well as Nargis. After her marriage to Sunil Dutt in 1958, Nargis gave up her film career to settle down with her family, after her last few films were released. She made her last film appearance in the 1967 film Raat Aur Din. The film was well received and Nargis' performance as a woman who has dissociative identity disorder was critically acclaimed. For this role she won a National Film Award for Best Actress and became the first actress to win in this category. She also received a Filmfare Best Actress Award nomination for this film. In 2011, Rediff.com listed her as the greatest actress of all time, stating, "An actress with range, style, grace and an incredibly warm screen presence, Nargis is truly a leading lady to celebrate." M.L. Dhawan from The Tribune said, "In almost all her films Nargis created a woman who could be desired and deified. The charisma of Nargis's screen image lay in that it oscillated between the simple and the chic with equal ease." She was also nominated to the Rajya Sabha (Upper house of Indian Parliament) from 1980–81 but due to cancer she fell ill and died during her tenure. 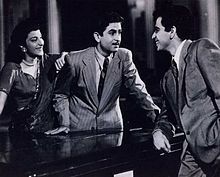 Nargis had a long-time relationship with actor Raj Kapoor, who was her co-star in the films Awara and Shree 420. Raj Kapoor was married and had children. After he refused to divorce his wife, Nargis ended their nine year-long relationship. Nargis married actor Sunil Dutt (a Mohyal from Jhelum, British India) on 11 March 1958. Reportedly, Dutt had saved her life from a fire on the sets of Mother India. They married on 11 March 1958. Three children were born from their union: Sanjay, Namrata, and Priya. Sanjay went on to become a successful film actor. Namrata married actor Kumar Gaurav, son of veteran actor Rajendra Kumar who had appeared alongside Nargis and Sunil Dutt in Mother India. Priya became a politician and a Member of Parliament (Lok Sabha). With her husband, Nargis formed the Ajanta Arts Cultural Troupe, which involved several leading actors and singers of the time, and performed at remote frontiers to entertain the Indian soldiers at border. It was the first troupe to perform in Dhaka, after the liberation war of Bangladesh in 1971. Later, Nargis worked for the cause of spastic children. She became the first patron of The Spastics Society of India. Her charitable work for the organisation got her recognition as a social worker. Nargis was diagnosed with pancreatic cancer in 1980 and underwent treatment for the disease at Memorial Sloan-Kettering Cancer Center in New York. Upon her return to India, her condition deteriorated and she was admitted at Breach Candy Hospital in Bombay. Nargis went into coma on 2 May 1981 after she became seriously ill and died the next day. Less than a week after her death, on 7 May 1981, at the premiere of her son's debut film Rocky, one seat was kept vacant for her. Nargis was buried at Badakabarastan in Marine Lines, Mumbai. A street in Bandra, Mumbai, was renamed Nargis Dutt Road in her memory. One year after her death, The Nargis Dutt Memorial Cancer Foundation (Barshi Maharashtra) was established by Sunil Dutt in her memory. Though it is widely believed Nargis died of cancer, recently her daughter Namrata clarified that she had fought the pancreatic cancer successfully but died from a urinary tract infection due to lowered immunity levels. Nargis was played by actress Manisha Koirala in the film Sanju, the biopic of her son, Sanjay Dutt. The film is ranked as one of the highest grossing Indian film of 2018. Feryna Wazheir played her character in the film Manto (2018 film). 1958 – She was the first film actress to conferred by the Government of India with the Padma Shri title, the fourth highest civilian award. 1968 – National Film Award for Best Actress for Raat Aur Din. 2001 – "Best Artists of the Millennium" award by Hero Honda and film magazine Stardust along with actor Amitabh Bachchan. A postal stamp of face value 100 paise was issued by India Post was issued in Nargis' honour on 30 December 1993. Google celebrated Nargis Dutt on her 86th birthday on 1 June 2015. The National Film Awards honoured Dutt by instituting the Nargis Dutt Award for Best Feature Film on National Integration upon her achievement in Hindi Cinema. Mr. and Mrs. Dutt: Memories of our Parents, Namrata Dutt Kumar and Priya Dutt, 2007, Roli Books. ISBN 978-81-7436-455-5. Darlingji: The True Love Story of Nargis and Sunil Dutt, Kishwar Desai. 2007, Harper Collins. ISBN 978-81-7223-697-7. The Life and Times of Nargis, T. J. S. George. 1994, Harper Collins. ISBN 978-81-7223-149-1. ^ "Why Nargis said 'Meena, Maut Mubarak Ho!'". Times of India. 2 December 2018. Retrieved 2 December 2018. ^ a b c d "Bollywood actor Nargis Dutt remembered in today's Google Doodle". The Indian Express. 1 June 2015. ^ "Nargis". Mint. 4 May 2013. ^ T. J. S. George (December 1994). The life and times of Nargis. Megatechnics. ISBN 978-81-7223-149-1. Retrieved 8 March 2012. ^ Parama Roy (6 September 1998). Indian traffic: identities in question in colonial and postcolonial India. University of California Press. p. 156. ISBN 978-0-520-20487-4. Retrieved 8 March 2012. ^ Shyam Bhatia (20 October 2003). "Nargis-Sunil Dutt: A real life romance". Rediff. Retrieved 3 June 2012. ^ "India's Independent Weekly News Magazine". Tehelka. Archived from the original on 5 April 2012. Retrieved 12 July 2012. ^ Mishra 2002, p. 65. ^ Sen, Raja (29 June 2011). "Readers Choice: The Greatest Actresses of all time". Rediff.com. Retrieved 19 September 2011. ^ Dhawan, M.L. (9 December 2007). "Queens of hearts". The Tribune. Retrieved 22 September 2011. ^ "Maharashtra govt in peril, governance takes backseat". Screenindia.com. Archived from the original on 1 January 2007. Retrieved 30 July 2017. ^ "Nargis: A daughter remembers". Rediff.com. Retrieved 30 July 2017. ^ "Clangorous Liaisons – Bhaichand Patel – Nov 19,2007". outlookindia.com. Retrieved 2 June 2015. ^ "Rishi Kapoor Reveals Dad Raj Kapoor's Alleged Affairs With His Heroines – NDTV Movies". Movies.ndtv.com. 17 January 2017. Retrieved 30 July 2017. ^ "Feryna Wazheir to play Nargis in 'Manto'". Times of India. Retrieved 30 July 2017. ^ a b c Dhawan, M. (27 April 2003). "A paean to Mother India". The Tribune. Retrieved 7 September 2008. ^ "Other side of Love Jihad", Siasat, 20 October 2016. ^ a b "The Tribune – Magazine section – Windows". Tribuneindia.com. Retrieved 30 July 2017. ^ "Nargis and Sunil Dutt's love story is nothing less than a fairytale romance! – Free Press Journal". 1 June 2018. ^ "Sanjay Dutt biopic: Manisha Koirala looks like a perfect replica of Nargis Dutt – Most talked about biopics you just cannot miss – The Times of India". The Times of India. ^ "Manisha Koirala Is Bang on as Nargis in Sanjay Dutt Biopic". ^ "Feryna Wazheir to play Nargis in 'Manto' - Times of India". The Times of India. Retrieved 14 December 2018. ^ Lohana, Avinash LohanaAvinash; Apr 11, Mumbai Mirror | Updated:; 2017; Ist, 05:07. "Feryna Wazheir to portray young Nargis Dutt in Nandita Das's Manto". Mumbai Mirror. Retrieved 14 December 2018. ^ "Filmfare Awards Winners From 1953 to 2018". Filmfare Awards. Retrieved 30 May 2018. ^ "The Tribune, Chandigarh, India – Nation". tribuneindia.com. Retrieved 2 June 2015. ^ "Nargis Dutt". Indian Philately. Thakkar Numismatic & Art Foundation. Retrieved 30 May 2018. ^ "An award in a different genre". Hindu.com. 7 January 2005. p. 2. Retrieved 30 July 2017. ^ "Archive News – The Hindu". The Hindu. Retrieved 30 July 2017. NDTV India Story on "Sunil Dutt, Nargis: a romance that rose from ashes"
Wikimedia Commons has media related to Nargis (actress).